If you're the kind of person who can't wait to control the iPod on long road trips, you belong on Turntable.fm, a new Web app that lets you take turns selecting and listening to music for a whole chat room. It's a fun, new way to listen to music (and waste time during work), but if you're caught unprepared, you'll be laughed out--or worse. So bone up on your DJ etiquette before you find yourself in the spotlight. Keep in mind that Turntable.fm is currently in a semiprivate beta, so you can't get in unless you have a Facebook friend who is already in. If you can't get in through a Facebook friend, you'll have to sign up for the invite list and wait. Be generous with your 'Awesome' and 'Lame' buttons: Those buttons aren't just for show. Click the 'Awesome' button, and your avatar will start nodding his head, plus the DJ currently up will receive one DJ point (which lets them unlock different avatars). Click 'Lame', and the DJ will lose one point. If enough people 'Lame' the song, the room will skip to the next DJ. Find your friends, easily: If you have Facebook friends currently logged in to Turntable.fm, it'll show you in the right column of the main page, under 'Friends'. Check the 'Room info' tab: Before you start playing anything, click the 'Room info' tab at the top of the window. It will show you a list of recently played tracks, and some additional description of the room itself--notes about the room theme, for example. The list of recently played songs is particularly important, because if you don't check it, you'll probably play something that ten other people have played in the last 30 minutes because they didn't check the list, either. Always keep a song in the queue: You can't hop into an open DJ spot unless you have a song in your queue, so always keep something in there. Once you have the spot, you can delete and rearrange songs in your list, but if you don't have any in there while you're in the audience, someone else might beat you to the spot and get those sweet, sweet DJ points. 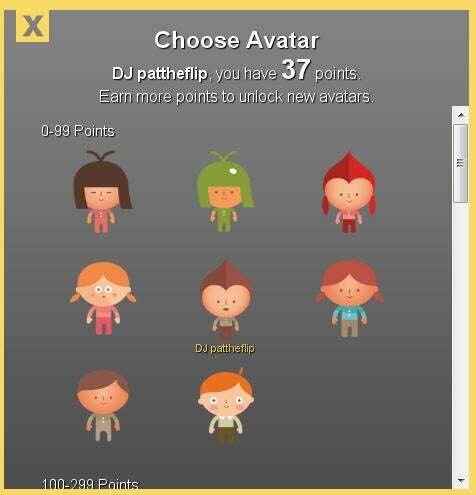 Get more DJ points, and you can unlock new avatars. Remember that songs add to the top of the queue by default: When you're uploading songs or choosing them from Turntable.fm's list and adding them to your queue, they'll appear at the top of the list. Be aware of that if you're adding to your list when your turn is just about to come--you might end up playing a song out of order. Keep in mind that old rooms never die: So far, at least, Turntable.fm rooms seem to be persistent--even if no one is in them. This setup can be handy if you have a regular group of people frequenting the same room, since the user who started the room will always have moderator privileges. The link to the room doesn't change, and if you remember the name, you can search for it from the main Turntable.fm page to rejoin it. Use the 'Top' button to bring a track to the top of your list: Turntable.fm is still in beta, and several users have reported problems with songs playing out of order. Currently, using the 'Top' button in your DJ queue seems to play the right song in order consistently, while dragging and dropping is less reliable. Shrink the Turntable.fm window by zooming out. Resize the window: If you're not actively paying attention to your Turntable.fm window, you can shrink it by using zoom in/out to change the size. Just hold down the Ctrl key and scroll down with your mouse scrollwheel to make it smaller. 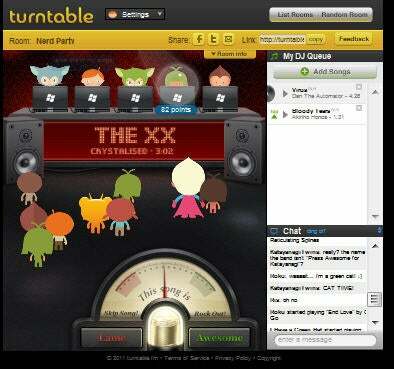 Add some extra features: It's tough to stay on top of Turntable.fm while you're at work. Grab the Turntable.fm Extended Google Chrome extension to add desktop notifications for chat, song changes, votes, and so on. Also, j2 Labs has an autovote bookmarklet if you want to minimize the Turntable.fm window and keep on giving props to the DJs. Patrick Miller covers HDTVs and how-tos for PCWorld. Follow him on Twitter or Facebook. Streaming music service Spotify finally lets users keep their iDevice but ditch iTunes. Music Beta is a snap to set up, easy to use, and has some pretty nifty features.